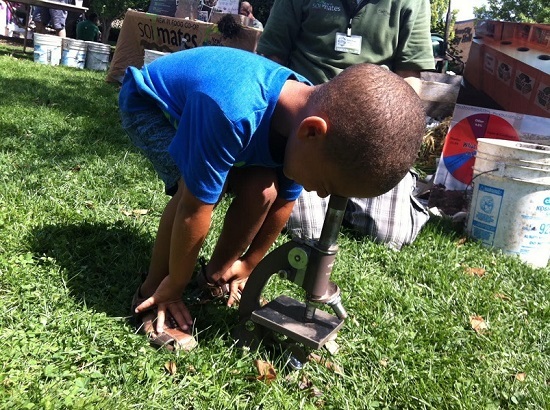 This past Saturday the Iowa City Science Booster Club held its first public event. Everyone had a great time, and it’s clear from the turnout that people want more opportunities to engage in science in their communities. More than two hundred and seventy people came by during our two-hour event. All kinds of people! Children, families, courting couples, single people, older adults, and the occasional sharp-dressed cyclist. Who doesn’t want to shoot lasers at things on a Saturday morning? And what could be more romantic than measuring your inamorata’s C02 output whilst you wildly dance? I like to see people having fun, but beyond this obvious pleasure our first event gave me a lot of hope for the Booster Club’s future. The amount of community support involved in putting the event together was really impressive. Ten volunteers committed time and energy on a weekend morning to make the event happen. People from all different parts of the community donated materials for the event, from tables to electronics to posters. I didn’t even have to rent a truck. People like science. People want more opportunities to do science in their lives; to have access to the processes of science. At this event, I saw even more clearly that people want this at a very young age. 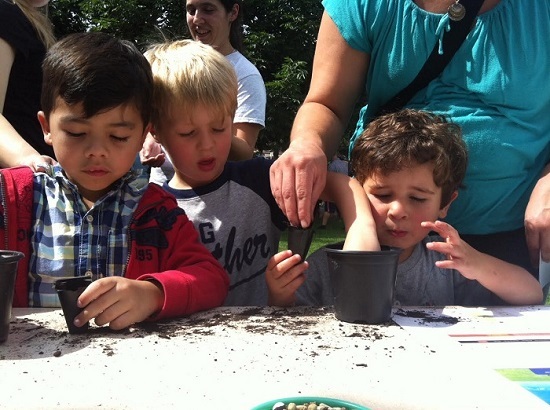 We had some activities, such as seed planting, for very young children to do while older children and adults gathered their own data about agriculture and climate change. As you can see from their faces, even very young children became completely absorbed in “doing science”. The more access these little kids were given to the equipment and practices of science, the more enthralled they became. The ability of the Booster Club Project to bring science into the public space, to provide access to science for people who may not be getting it anywhere else, is really exciting. Many children grow up never knowing any scientists. They never see any scientists other than the mad kind on TV. How much easier will it be for the children who went to this event to imagine themselves as scientists? Not only did they get to play, they got solid evidence that scientists are people like them. Of course, the purpose of the Booster Club Project is not only outreach. We want to do more than change perceptions of science in communities; more than give people a chance to experience the joy and excitement of the scientific process. We want to give practical support to local teachers. Raise money to cover costs for scientific equipment and field trips and memberships in professional teacher societies—the many things that teachers want and need. One thing that really surprised me at this first event was how many people in the community didn’t even know about these needs. Over the last few months, I’ve learned a few things about science teaching in my community. I‘ve found that science teachers have many more unmet classroom needs than I had anticipated. Needs for basic equipment, like chemical-resistant tables. I’d thought the Booster Club Project might supply the icing on the cake. Turns out, we’re short on cake. In some cases and some places, we don’t even have anywhere to serve the cake, or even flour and eggs. People don’t know about this. I’m not surprised—I didn’t know it, either. People know about budget cuts to music and art programs and it makes them mad. In some districts, it made people mad enough that something else had to go on the chopping block for the next round of cuts, and it turns out that thing was often science. All across our country, there are science teachers teaching out of decades-old books, whose only supply budget comes from their own pockets. Science teachers who are giving it their all, but who lack basic support and equipment. And people don’t know about it. As we raise support for science in communities, and use the Booster Club Project to explore and meet teacher needs, I hope we can bring this issue into the light. Our nation needs to keep a priority on STEM education from the very beginning. We shouldn’t place the blame for inadequate STEM scores on teachers who lack basic support and equipment. 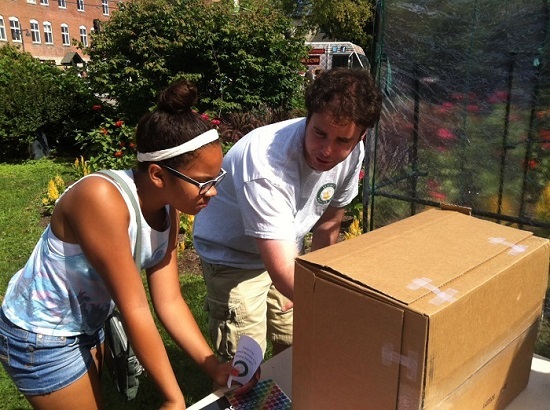 Communities have the resources to help meet the needs of our science educators. As we move forward with the Booster Club Project, our number one goal will be making those needs clear—and giving everyone in the community a chance to experience science first-hand.